Mounts built to be durable. Glacier-Computer offers a wide range of custom engineered and off-the-shelf Computer Mounting Equipment to meet your specific applications. 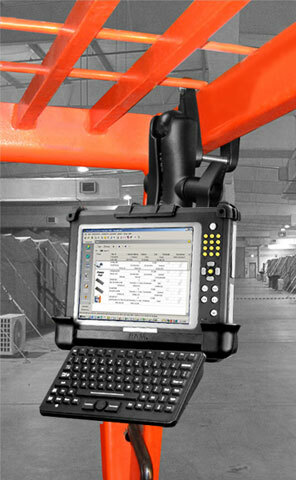 Whether on a forklift, construction vehicle, cart, dock door, police car, or shop floor, Glacier-Computer has a Computer Mounting Equipment to optimize space and usability. All Glacier-Computer Computer Mounting Equipment solutions are designed and built to withstand the same harsh environments that our computers are designed to withstand. Please call one of our sales representatives to help with your specific configuration. DL8xxx Series Scanner Universal Mounting Kit Please call one of our sales representatives to help with your specific configuration. Mount, RAM. 1.in. Dbl Skt Arm, 4.625in. Please call one of our sales representatives to help with your specific configuration. Mount, RAM, 2.25in. Ball, Round Base Brass Please call one of our sales representatives to help with your specific configuration. Mount, RAM, 1.5in. Ball, Round Base Please call one of our sales representatives to help with your specific configuration. Mount, RAM, 6.875in. Medium Dbl Skt Arm for 2.25in. ball Please call one of our sales representatives to help with your specific configuration. Bracket, Support mount for 15in Everest Please call one of our sales representatives to help with your specific configuration. For GX Square ball 2.25 ball and mounting hdwr Please call one of our sales representatives to help with your specific configuration. Ball with hardware Please call one of our sales representatives to help with your specific configuration. Mounting kit, Desk, Medium Arm w keyboard Please call one of our sales representatives to help with your specific configuration. Mounting kit, Desk, Short Arm Please call one of our sales representatives to help with your specific configuration. Mounting kit, Desk, Medium Arm Please call one of our sales representatives to help with your specific configuration. System for target. Please call one of our sales representatives to help with your specific configuration. Mounting kit, Forklift, with keyboard., Short. KB arm, Short mount arm with 4 inch clamp Please call one of our sales representatives to help with your specific configuration. Mounting kit, Forklift, with Keyboard., Med. KB arm, Long mount arm with 4 inch clamp Please call one of our sales representatives to help with your specific configuration. Forklift mount kit for 15 inch Everest w 3.38 inch ball and socket w lift truck mount kit Please call one of our sales representatives to help with your specific configuration.